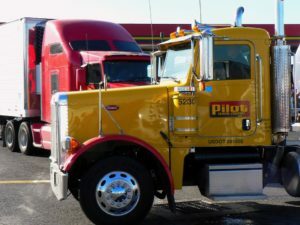 Over-the-road and long-haul truckers face unique obstacles with workers’ compensation when they are injured driving their rig. These unique obstacles are created by the nature of the job and the employer’s efforts to save money on workers’ compensation insurance premiums. These are just a few of the issues over the road truckers’ face that we can help with. Pennsylvania Jurisdiction of a Trucker’s Workers’ Compensation Claim: What state can you bring your claim in? The trucking company you work for is headquartered in one state, you reside in a different state, and your workers’ compensation injury takes place in a third state. Do you know which state’s workers’ compensation system you are entitled to receive workers’ compensation benefits from? If an injured trucker has rights to receive workers’ compensation benefits in more than one state, the typical trucking company will open the workers’ compensation claim in the state that pays the least amount of workers’ compensation benefits (like Indiana, Arkansas, etc.) to the injured trucker, rather than a state that is traditionally fair to the injured worker—like Pennsylvania. Even if you are being paid workers’ compensation through one state’s workers’ compensation system, you may be able to have your case transferred to another state—such as Pennsylvania. Our experienced Erie, PA and Smethport, PA workers’ compensation lawyers can help you transfer your trucking accident workers’ compensation claim to Pennsylvania. Depending on the situation, an injured trucker that transfers their workers’ compensation to Pennsylvania could receive thousands (or tens of thousands) of dollars in additional workers’ compensation payments over the course of his or her claim. We’ll look at the facts of your case and help you figure out if we can get you more compensation. Most trucking companies will have new hires sign a contract stating that a trucker agrees to have their workers’ compensation case handled in a specific state. Conveniently enough, the state that employer always selects a state that plays minimal workers’ compensation benefits to the injured trucker. In Pennsylvania, these types of contracts are typically not enforceable by an employer. Workers’ Compensation benefit payments for lost wages are calculated based upon your earnings prior to your work injury. As over-the -road truckers are not paid an hourly rate, insurance companies often understate an over the road trucker’s income prior to the work injury in an effort to pay the injured trucker less in workers’ compensation benefits than the injured trucker is entitled to receive. If the insurance company has not provided you with a “Statement of Wages” showing the calculation that they have used in determining your workers’ compensation payments, this is a red flag. Do not take the insurance company’s word that the amount they are paying you is correct. Have an experienced workers’ compensation attorney review your case and the amount of compensation you are receiving. Even if taxes are not being withheld from your paycheck and you receive a 1099 at the end of the year, it does not necessarily mean that you are an “independent contractor” in the eyes of the law. There are many factors used by Pennsylvania courts to determine whether an individual is an employee or an independent contractor. A primary factor in determining whether an individual is an employee or independent contractor is who has the right to control either the work to be done or the manner in which the work is performed. If you have been denied workers’ compensation benefits because your employer or their workers’ compensation insurance carrier has labeled you an “independent contractor,” contact our office to have an experienced workers’ compensation attorney review the facts of your case. In situations where another person or party is responsible for the happening of a work related injury, the injured worker can pursue a claim against the third party. Pennsylvania’s workers’ compensation system does not permit an injured worker to receive compensation for pain and suffering from the workers’ compensation insurance company, but an injured worker can receive compensation for pain and suffering by pursuing a third party claim! If you are injured on the job and believe a third party may be responsible for the happening of your work injury, contact our office to have an attorney experienced in both personal injury and workers’ compensation review the facts of your case st 814-452-6232.